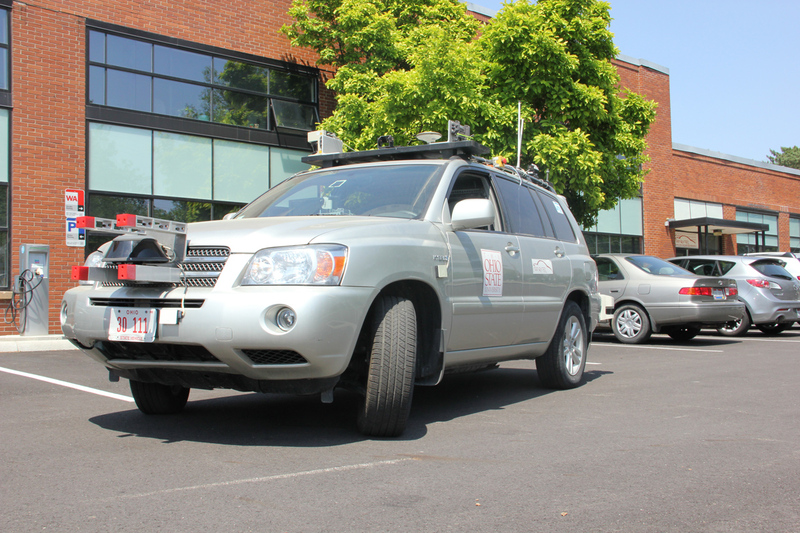 Outfitted with sensor-like cameras, radar and range-finding systems this SUV can drive autonomously around the Center for Automotive ResearchResearchers at The Ohio State University hope to save lives and reduce the severity of human injuries in auto accidents by looking closely at what happens in the final seconds before vehicle collisions. The goal of the university’s new Crash Imminent Safety University Transportation Center (UTC) is to increase understanding of technology design and improve the ways humans interact with intelligent, autonomous and semi-autonomous vehicles. The research will include developing advanced accident simulators, performing extensive modeling, analyzing past accidents and developing autonomous vehicles – all with the goal of making the U.S. transportation system the safest in the world. The center and its research will be funded by a grant from the U.S. Department of Transportation. The university will receive $1.41 million in 2013 and has requested an additional $1.5 million for 2014. The award and associated cost sharing total $4.3 million over the first two years of operation. Partner universities working with Ohio State on the UTC are Indiana University-Purdue University in Indianapolis; North Carolina A&T State University in Greensboro; University of Massachusetts in Amherst; and the University of Wisconsin in Madison. “During the last few years the introduction of autonomous cars into human-driven traffic has raised safety concerns about the design of these vehicles and how humans will react to them,” said Umit Ozguner, Ohio State professor of electrical and computer engineering and head of the research center. ”Analyzing what happens in a vehicle in the moments leading up to and during an accident is critical to understanding how to mitigate injuries and fatalities. A key component of the research will be development of a common, networked driver simulation that will allow researchers to experiment with pre-crash safety through simulated accidents. Ohio State boasts world-class facilities, from a new driving simulator to resources at the Center for Automotive Research. Collectively, the university’s activity and expertise aligns extremely well with the development of autonomous ground vehicles, driver behavior, biomechanics and all automotive safety technologies. The center also will leverage extensive existing facilities and field experiments being conducted at Ohio State’s Transportation Research Center (TRC) with the common, networked driver simulation to create an unprecedented ability to experimentally address pre-crash safety. The award to Ohio State’s consortium was part of a $63 million transportation safety grant package announced from the U.S. Department of Transportation’s Research and Innovative Technology Administration (RITA). The grant package will fund projects at 33 UTCs nationwide. More than 142 applications were submitted to RITA for the grants.